For meeting the differing needs of specific applications, ReadyDATA 516 users can mix-and match SATA and SSD drives within volumes to provide a stunning boost to performance and flexible capacity. ReadyDATA 516 is available as a diskless chassis (RDD516). Only pre-certified disk packs from NETGEAR are compatible with ReadyDATA storage devices. For your convenience, NETGEAR offers a wide variety of disk types, capacity and speeds. As the first ReadyDATA device in desktop form, ReadyDATA 516 is packed with enterprise-class technology and delivered with ease-of-use features that enable small and medium-sized businesses (SMBs) to effectively use them. ReadyDATA 516 (RDD516) enables comprehensive edge-to-core data protection when used in tandem with a ReadyDATA 5200 (2U rackmount) or additional ReadyDATA 516s. It is significantly less expensive and dramatically easier to use than comparable enterprise-class offerings. ReadyDATA 516 ships with a full suite of advanced features such as block-level replication, deduplication, and thin provisioning. With a maximum capacity of 24TB the performance boost that comes from supporting a mix of SSD and SATA drives within a volume, ReadyDATA redefines the concept of storage for small and medium businesses and remote offices/branch offices (ROBO). Never before have so many features come standard on an enterprise-class storage device, especially one with a price tag that is comfortable for even the smallest of IT organizations. 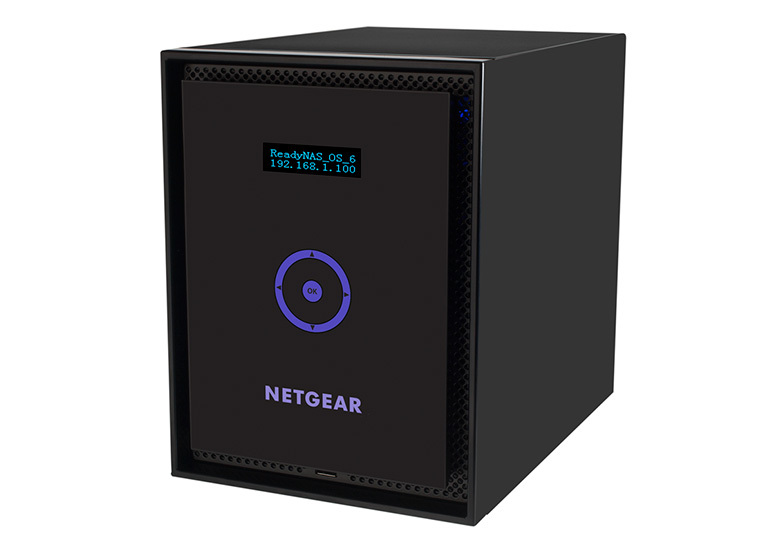 The ReadyDATA 516 is easy-to-use unified storage from NETGEAR designed to address serious data management issues with a single system. In addition to being simple for IT professionals to use, the all-inclusive feature set and simplified packaging of disk components make ReadyDATA an easy solution to sell for PowerShift partners. 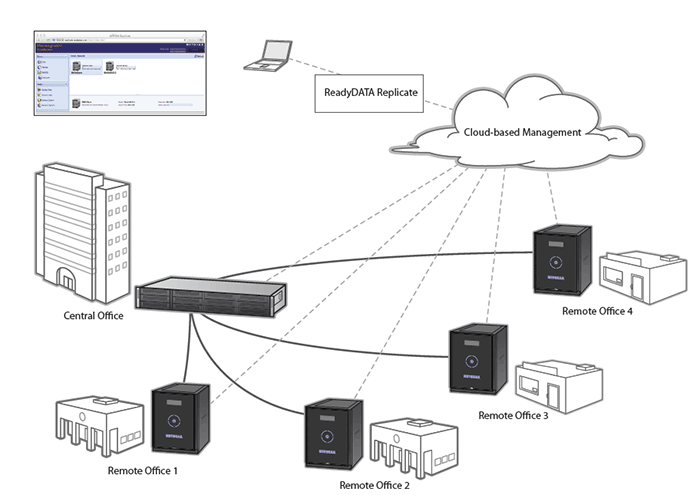 Build managed backup solutions based on ReadyDATA technology and protect data for customers, large and small. 2x1 1GbE ports and virtual network interface support ensure that even in I/O intensive virtual environments, network bottlenecks are a thing of the past. 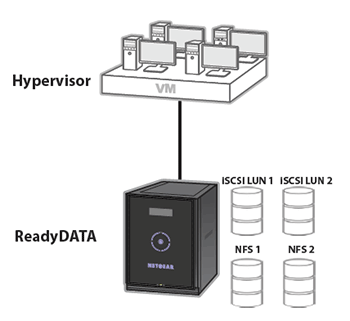 ReadyDATA also supports industry-standard file sharing protocols including iSCSI, CIFS, and NFS. With data volume growing faster than ever before, the need to find more efficient ways to store and manage data is crucial. Unlike enterprise-class storage from traditional vendors, a full set of advanced data management technologies come standard with every ReadyDATA. Backup: Unlimited, pointer-based snapshots give you complete control over the past, present, and future of your data, be it file or block data for server applications and virtualization. 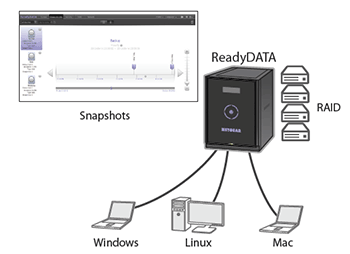 Download the NETGEAR ReadyDATA 516 Datasheet (PDF).